First off, let me apologize to my wonderful secret santa recipient, Brickty, who was extremely nice about the fact that I’m super late on submitting this story. I had an extensive lapse in motivation, and then school started back and I realized I had way less time to work on it. Regardless of all that though, it’s finally here. Hopefully it’s alright, lol. Also, as a quick author’s note before you read this, I just want to say that I chose to omit a large portion of added dialogue where someone would be translating words for Shizune and those she is talking to. Overall, the story seemed to flow better without these constant interruptions, so they’re pretty much written out like normal conversations. Prompt: Rin is recruited by The Student Council to paint something, and she and Shizune have to work with each other. Hilarity ensues and all that jazz. The hallways of Yamaku are lively with the bustle of students working on their own parts of the upcoming winter festival. Groups skirt around them, many carrying decorations, food, and building parts for stands. Shizune nods approvingly, glad to see that the student body is so hard at work. A few more paces down the hall, they nearly collide with Hisao and Emi as they speedily round a corner. The duo stumbles to the side, narrowly avoiding crashing into Shizune’s translator for the day, Mr. Masahiro Akita. The instant they’ve regained their footing, Shizune’s hands begin flitting back and forth. [How many times do I have to tell you not to run in the halls?!] She frowns at them both in turn. Shizune groans inwardly, knowing full well that they will. Despite this, she dismisses them with a wave of her hand. 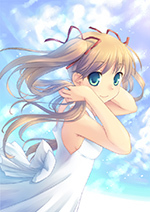 Hisao shoots her a smile, wishing her luck as they scamper off at a slightly slower pace. Shifting up her glasses, she can’t help but smile as well. Hisao may be constantly exposed to a poor influence, but his time with Emi has made him a driven and hardworking individual; Shizune can’t help but admire that. A tap on her shoulder rouses the student council president from her thoughts. Akita gestures towards the art room and Shizune nods, the pair continuing to their destination. Upon reaching it, she feels a prick of dread at the thought of tackling this task without her friend Misha. Unfortunately, a student council presence was needed elsewhere for festival preparations, so Shizune can only hope that Akita is able to handle whatever this meeting might entail. Pushing away her last doubts, Shizune raps her fist on the door in 3 short knocks before gripping the handle and pushing in. Inside, the art room looks as it always does; brushes, easels, and various other art supplies stacked and organized in the back of the room, while the rest of the space is taken up by cleared off tables and stools. Only one table is occupied, though rather than art supplies, it holds a girl. Rin is lying stomach down across a table near the window. A pencil spins idly between her toes at the other end while her face points towards the far side of the room, propped up by her chin. She doesn’t acknowledge either of them at first, seemingly content to remain locked in her current position. Shizune, however, is upon the auburn haired girl in an instant, signing heatedly. Akita steps forward, his small stature entirely contradicting his position of authority over them. He attempts to translate Shizune’s words in a less harsh manner. “Rin,” she responds, not even looking in their direction. With a confused expression, Akita turns to Shizune, who is already rubbing the bridge of her nose as she keeps her temper down. She knew that dealing with Rin would be quite the challenge for her temporary companion, but being flustered this early could imply bad times in the near future. [And does this art have anything to do with the holiday festival?] Shizune signs through gritted teeth. Holding back a sharp retort, Shizune explains that Rin has been assigned to creating holiday themed backdrops that will be used as dividers between the stalls across the festival. Because of the layout of the few stalls, only 4-6 paintings are really necessary to cover all bases. “My aesthetically pleasing or your aesthetically pleasing?” Rin asks, cocking her head to one side. Shizune gasps wordlessly as Akita translates, casting an icy glare on Rin who meets it with apathy. A spark of anger passes between their gaze, almost entirely one-sided, but before anything else can be said Akita interjects. “Mr. Akita is right, you know,” Rin comments. Shizune’s eyes widen as Akita translates Rin’s response, his own face reflecting her shock. “Yeah, he didn’t,” Rin murmurs, glancing absentmindedly out the window. [Even after all the times I’ve had to reprimand you and your friends?] Shizune queries, narrowing her eyes at Rin. The student council president pushes her glasses up a bit and pinches the bridge of her nose, a flurry of potential scathing remarks flooding her brain. Rin’s exceedingly nonchalant attitude towards the matter only worsens things. Shizune lifts her arms indignantly, preparing to scold Rin even further. However, she’s stopped by the gentle resting of a hand on her own. Akita pulls her arms back down slowly, shaking his head. Begrudgingly, Shizune allows them to fall back to her sides, though her irritation at being the one who must be handled in this situation continues to smolder. Rin sniffs, staring at Akita blankly. After a few moments pass, she nods and begins gathering the supplies to start. As Rin sets up, Shizune takes a seat a short ways off and drums her fingers against each other impatiently. She realizes that at this point, her only option is to wait and hope for the best. Time stretches on as the three sit through it in silence. Despite Shizune’s mixed feelings towards the girl, Rin appears to be working diligently, intently focused on her art. Partway through her third sketch, she whirls around to face Shizune. Shizune stares back with her eyebrows raised, unsure of how to answer. Shizune stares at Akita incredulously as he translates, but he simply shakes his head as if to say he’s as lost as she is. She stands and strides over to Rin, bending down to get a better look at the two pieces laid out on the table in addition to the third resting on an easel. The incomplete piece seems entirely normal; the backyard of a small home in a suburban neighborhood, covered in lights and blanketed by snow. “Not if it isn’t complete,” Rin states, shaking her head and ruffling her hair. Shizune struggles to see what could possibly be missing from such a simple work, but she holds her hands. After studying the lone piece on the easel, she moves on to the two spread across the desk. At a glance, they both appear to be nothing special. One depicts a snowy mountain with a large moon in the sky, lighting a forested landscape that extends forever. The other shows a sprawling city filled with lights being gently dusted by a late night snow. Near the top of the canvas, a figure soars across the sky in a sleigh, carried by numerous creatures in front of it. However, upon further inspection Shizune notices details that seem rather out of place. In the mountain sketch, the moon has a ghastly face filled with anger, almost appearing as if it’s preparing to drop down onto the serene scene below it. The cityscape seems much more normal, until Shizune squints at the flying figures and discovers that the ones pulling the sleigh aren’t animals at all, but rather people, flapping madly to stay afloat. “Normal,” Rin says, giving no sort of answer to the posed question. [Yes, normal. Like this one you drew over here.] Shizune gestures towards the incomplete suburban piece. Rin stares at the drawing for an abnormally long time before turning to face her peer. “I never used to think ‘normal’ and ‘boring’ shared so many qualities,” she muses. Shizune glances back to Akita, who shakes his head at her. [There isn’t an ounce of sarcasm in her voice,] he signs, clearly still getting used to her odd demeanor. The two listen to her rant for a bit longer before Shizune interjects, hoping to steer the conversation back to where it should be. [Well, if ‘normal’ and ‘boring’ aren’t the same, apparently I know very little about art,] she forms, attempting to give off a joking air. Shizune’s jaw drops and she stares at the artist for a few moments before collecting herself and exiting the room. Once in the hallway, she begins taking deep breaths, calming herself. Only a few seconds pass before Akita appears in the doorway to the art room. A stern look from Akita causes Shizune to drop her defense slightly and consider what he has said. Akita runs a hand through his neatly trimmed brown hair. At first he seems upset, but after a couple of seconds Shizune realizes that he’s chuckling to himself. Despite wanting anything other than a lecture right now, Shizune can’t argue with him or his point. She begins to sign that they should return when Akita’s head snaps up and turns towards the art room door, which is slowly closing. Together, they return to the room to find it empty. Akita looks to Shizune, his eyes worried, but she has already figured out what’s going on. Akita simply nods as Shizune makes her way out of the room and down the hall. Before long, she finds herself standing at the door to Yamaku’s roof. The student council president in her causes hesitation at going somewhere she really shouldn’t be, but she shakes away the thoughts. Steeling herself, Shizune pushes out into the brisk open air. Across the rooftop the setting sun peeks over the edge of the building, casting a deep orange glow across everything in its path. Sprawled out near the fence is Rin, her short hair splayed out behind her as she stares up at the clouds. If she noticed Shizune’s arrival, she makes no sign of it. Shizune makes her way over to the girl and gingerly sits down next to her, wishing there was something other than the rocky roof covering under her. She slides the notebook and pen over to Rin, who finally acknowledges her presence. [Did you come up here to get away from me?] Shizune signs the words before Rin can look away. The girl shrugs without sitting up. To her surprise, rather than dismissing the statement with a nod or shrug, Rin leans up and works the pen into the groove between her toes. She scrawls out a note for Shizune with impressive speed. Rin pauses, writing here and there for a while before revealing the note. Shizune stares in shock at the novel covering the sheet of paper. She looks up at Rin, the girl usually so deadpan and spacey, questioning where this insight came from. Rin seems to understand the look in her eyes and scribbles a quick message onto the paper. The explanation makes more sense than Shizune expected, and in spite of everything she finds herself shaking silently with laughter. “Is it?” Rin presents the note with an overwhelming lack of expression. Shizune rolls her eyes, but they still shine with humor. Although she can’t tell if coming here produced the desired outcome, or if her apology was even accepted, she feels satisfied. Rin looks at her briefly before her gaze lands on a cloud skimming lazily across the sky. She stares at it for quite some time, almost as if in a trance, before shifting into a crouched position and pushing to her feet. Shizune stands as well and follows her to the door. Before long, both students are back in the art room, startling a dozing Akita. Akita looks between the two of them, apparently wanting to ask a multitude of questions. After another moment of deliberation, he exhales and nods to each of them. “Good luck, then,” he says, slipping out of the room. Once he’s gone, Rin beckons Shizune over to a corner filled with supplies. She nods towards a few long planks of wood stacked against the wall, presumably delivered for this very task. Shizune returns the nod, grabbing the top one and shuffling awkwardly across the room with it. Rin walks ahead of her and shifts her easel to be centered between two desks, allowing Shizune to set the plank down across it and have it supported by the tables. Rin says something, which Shizune assumes is a “thanks,” before she takes a seat and writes out a new message on their notepad. Shizune notices Rin’s nose wriggle as she snorts, a small smile finding its way to her mouth. As she puts her brush to the long wooden board, Shizune glances out the window. A lone cloud is silhouetted against the setting sun as it blows into the distance. Momentarily, she wonders if this is the same cloud that had enraptured Rin earlier. A few seconds pass and she scoffs at herself. Regardless, she looks back to Rin with some small amount of newfound respect, watching as she gracefully sweeps her brush along the board and creates the perfect winter backdrop. Well even though this is later than my own birth was, I’d still say it was worth it. I honestly had no idea how this pairing would go as we don’t really see it often. But you made it feel way more natural than I expected and the story made me madly smile by the end of it. Hats off to ya. That's an excellent piece. Different ways of looking at the two characters, without making them OOC. Well done, Scratch! Nice work. I enjoyed how you handled the contrasts between Rin and Shizune's personalities. You really don't see them interact too often in stories and you especially don't see them getting along.